Planning for the 2017 Birchall Leadership Award Dinner is in full swing. Under the capable leadership of Hamilton Branch President 5337 Bob Carr and the President of the Canadian Warplane Heritage Museum (CWHM) and former RCAF Pilot, Dave Rohrer, the event is shaping up to be a great success. Saturday 28 October 2017, at this gem of a flying museum in Hamilton, is the date for this black tie event that will feature a four course dinner, presentation of the Award to and keynote address by 13738 Col (ret) Chris Hadfield, entertainment by another Canadian legend, John McDermott, and many more surprises. 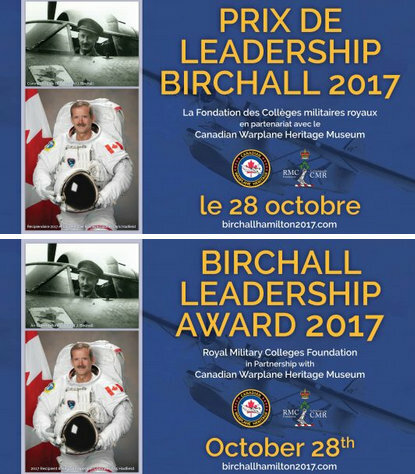 Some of these include meeting past Birchall Award winners, members of the Birchall family, and posing with, or reserving a flight on, the museum’s Consolidated PBY – 5A Canso where you can see Air Commodore Birchall’s signature. The evening is guaranteed to flow smoothly under the most capable guidance of our Master of Ceremonies, CBC’s Peter Mansbridge. Sponsorship opportunities are still available for your company or organization to join Pioneer Energy, La Corporation du Fort Saint-Jean, ADGA, Power Corp, CAE and others as corporate sponsors to this prestigious event. Classes, groups of ex-Cadets, teams, Squadron mates, etc. – book your tables now! Individual tickets are also available. All proceeds from the event will support the Royal Military Colleges Foundation and the Canadian Warplane Heritage Museum. Looking forward to seeing you all in Hamilton in October!